One of the best things about being in Costa Rica (besides the awesome surf!) is the amazing fresh fish. 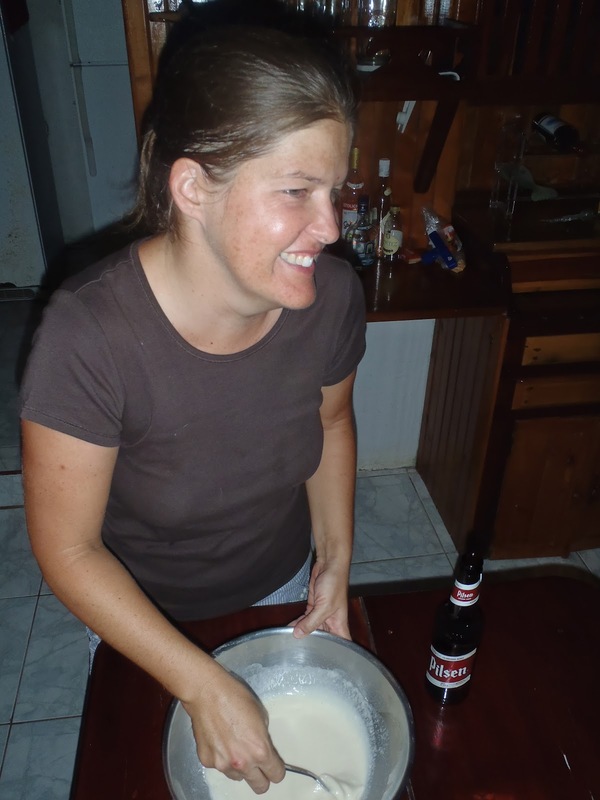 Here at our home away from home, La Ponderosa, owners Angela and Marshall offer amazing homemade meals each night. The other night they got some snapper right off the boat from local fisherman. Angela made this amazing meal for us and hopefully if you are ever in Costa Rica, you will have to make sure you get a chance to try it too!! It is amazing! But if you cannot get down to Costa Rica, give it a try on your own with whatever fish is local and in season. Filet fish and remove all blood line, cut into nice size pieces. Season the fish if you like with a little salt, pepper or garlic powder. Cover pan with oil. The secret tip is that Angela uses on old cast iron skillet, we believe it adds extra flavor and heats the oil just right. You want it on about medium heat, don't let the oil smoke, if it does it is too hot and you need to turn it in. Combine all dry ingredients in a bowl. Next combine the beer with the dry ingredients and mix till smooth with a fork. The batter should not be too thick, if it is then you will need to add more beer. Drench filets in batter then add to oil. You do not want to crowd the pan so you may have to do a couple of batches. You will fry the fish for about 5 min. per side till golden brown. When you remove the fish from the oil, place on a platter covered with paper towels to drain well. Mix all ingredients together and serve with your fresh fish! 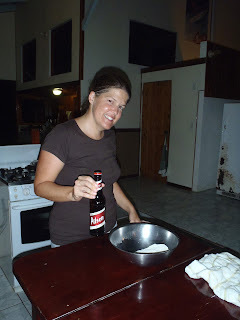 Angela with her favorite beer, Pilsen! Drench the filets in the batter. Don't crowd the pan and make sure your oil is not too hot. Make sure to drain on paper towels when you remove the fish.